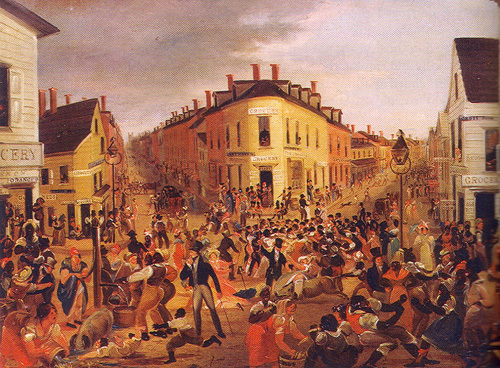 Five Points (or The Five Points) was a neighborhood in central lower Manhattan in New York City. The neighborhood was generally defined as being bound by Centre Street in the west, The Bowery in the east, Canal Street in the north and Park Row in the south. The former neighborhood known as Five Points is now split between the Civic Center- an area of city, state and federal court houses and administrative buildings, on the west and south and Chinatown on the east and north. The name Five Points was derived from the five-pointed intersection created by Orange Street (now Baxter) and Cross Street (now Mosco); from this intersection Anthony Street (now Worth) began and ran in a northwest direction, creating a triangular-shaped block thus the fifth “point”. To the west of this “point” ran Little Water Street (which no longer exists) north to south, creating a triangular plot which would become known as Paradise Square or Paradise Park. Five Points gained international notoriety as a disease-ridden crime-infested slum that existed for well over 70 years. This is adjusted from a traditional Manhattan recipe. Only it feels a bit more dirty and aggressive. Hence the name. Combine ingredients in a cocktail shaker filled with ice and shake well — at least 30 seconds. 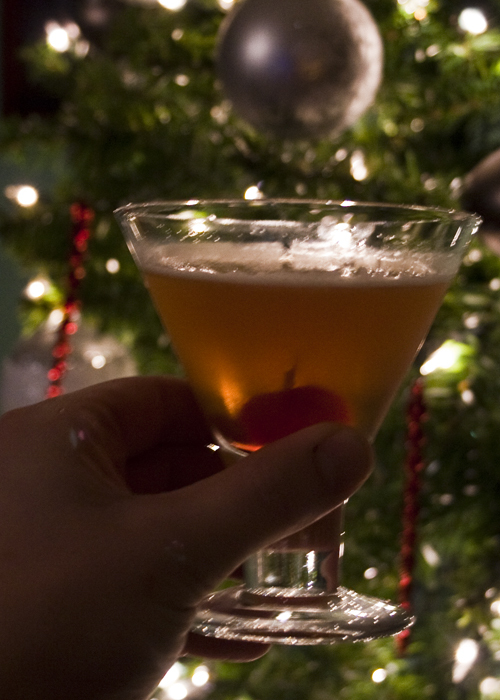 Strain into a chilled martini glass then garnish with a maraschino cherry. A little bit of spice to back up that traditional sweet. It’s not much like a Manhattan, really. Call it a spiritual cousin.